Whatever happened to Wireless USB & HDMI? A few years ago, we were promised that USB cables would be a thing of the past. And that our HD TVs would also connect to our Sky boxes and Blu-ray players wirelessly. So where are the wireless ultrawideband (UWB) technologies that were supposed to get rid of these cables? Picture the scene – it's CES 2007. The consortium of manufacturers that make up the USB Implementers Forum has a small but significant presence on the show floor, demoing cameras which download their pictures to your PC just by being placed in their presence. A printer starts spitting out high quality prints with no cables attached. In a side room below the Sands Convention Centre, Philips shows off TVs with Wireless HDMI adaptors. It's a triumph, winning praise from those who like to mount their screens on the wall, but dislike the thick corded cables that mess up a minimalist lounge. Two years later, Ofcom declares UWB tech fit to use in the UK. Pundits rejoice, with some (even on this site) declaring that Wireless HDMI would be the standard by 2010. And things definitely haven't got to this stage. Wireless USB was supposed to be a game changer. Within three metres, it is technically capable of the same speeds as USB 2.0, and can still manage a respectable 110Mbps at 10m range. Because it works in the UWB spectrum, it doesn't need line of sight to a receiver and it's resistant to interference too. Yet it's one of those great technologies that may simply never happen. Part of the problem was the delay between announcing standards and the lifting of regulatory restrictions for devices operating in the UWB spectrum (3.1 to 10.6GHz). It took several years between development of the standard and authorisation of its use, and regulatory requirements are still different in different countries. By the time most territories had authorised the airwaves necessary (around 2009), fast 802.11n Wi-Fi was commonly available. Many of the things that Wireless USB was developed for were being done just fine over that. Want to print wirelessly? No problem, there's barely any price premium to pay for a multifuinction printer and scanner that has Wi-Fi built in now. Laptops with Intel's Wireless Display (Wi-Di) tech on board can even send HD pictures directly to a TV over Wi-Fi (albeit unreliably laggy at present). And why build a camera with Wireless USB to copy pics to your hard drive, when you can upload shots directly to Facebook if it has Wi-Fi on board? Didn't you hear? The iPhone 4 is the most popular camera on Flickr now, and that syncs your snaps automatically over a cell signal. 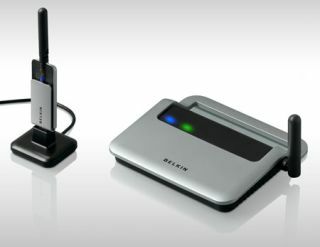 Belkin, as ever an early adopter of these types of things, was one of the first to launch a Wireless USB hub and adaptor kit. Which is no longer on sale. It's not just about red tape, of course. Other reasons for the delay come down to inconvenience and cost of adding WUSB to a new peripheral when there are no laptops or motherboards that have transceivers built in. Another adapter is confusing and pricey for consumers – making wireless strangely less convenient than wires. Plus, there's the fact that USB has since been settled on as the cable of choice for charging phones and media players. Plans are afoot to enhance voltages over USB ports so they can be used to charge tablets too. Since wireless power is another idea whose time is not yet come, there's no sense including a WUSB antenna when you'll be connecting by cable anyway. And finally, while investing in WUSB has no guaranteed returns for manufacturers, excitingly fast new cabled connections like USB 3.0 and Lightpeak/Thunderbolt are a safer bet. Western Digital, for example, has shifted its entire portable hard drive range over to USB 3.0 already and is looking at Lightpeak/Thunderbolt for the future. It has no plans to start introducing WUSB anytime soon. Why would it? Adding another chip and a battery into a hard drive would be madness when we have Dropbox for that kind of thing. The cloud make WUSB almost defunct. If Wireless USB has an uncertain future, then, what's the prognosis for Wireless HDMI? Far from being standard by 2010, there are almost no TVs with Wireless HDMI built in, and none that are available in the UK. A couple of years ago, there were at least two models – one from LG and one from Panasonic – available. So we're going backwards. To a certain extent, that's understandable in a time of tough economics - compared adding internet connectivity and 3D glasses, Wireless HDMI is unlikely to sell many more TVs to consumers. There are, however, lots of Wireless HDMI adaptors available – although with prices for the likes of the Xenta kit starting at £150, they aren't exactly cheap. But wireless display technology does seem to be slowly catching on, although they're coming from PCs rather than TVs. There's Intel's Wi-Di (mentioned earlier), and ASUS has its Kinect-like Wavi Xtation on the way. Samsung's Central Station monitors, which combine both a wireless USB hub and display adaptor, are here already and have proved themselves admirably capable in reviews. Whether or not techniques for streaming video to a screen will converge around a standard like Wireless HDMI is uncertain, then. But we do still hope it catches on: there's no getting away from the fact that those cables running up the wall are very ugly.